Resumes, what is the big deal? You list your qualifications, your key skills and your work history, round it off with your references, make sure your contact details are there, and off goes the email. Too easy, right? Not quite. You begin to wonder why you are not making interviews. Or even getting a reply at all. A recent study has shown that amongst the biggest turn-off’s for recruiters is lack of a personal summary, the omission of a valid address, and concerns over CV length (being too short as opposed to too long!). Other major traps some applicants fall prey to are grammatical and spelling errors which – which, with today’s ability to spell-check and correct grammar – are especially poor form. Additionally, with many companies using online portals to accept job applications, many applicants fail to read the small print in terms of formatting. This is especially true of public sector positions. Page, word, even character limits come into play, as well as fonts, point size and file types. Although these are in place to help the recruiter easily formalise and examine applications, it also speaks of the applicants’ attention to detail to follow the application process properly; therefore, even perfectly written applications that fail to adhere to formatting requests can be automatically dismissed. Also, in today’s keyword-driven online culture, many recruiters will automatically be looking for certain words and phrases which align with their requirements. These vary and will include words and phrases that directly relate to the position along with industry-specific terms and positive adjectives that reflect your personality and attitude. However, being aware of using keywords and being able to use them strategically is not necessarily the same thing. Inappropriately applying keywords or endless repetition will be spotted immediately. So the knack is to artfully work them into your career summary and outlook in such a way as to be organic and congruent. If all this sounds like hard work, it need not be. Here at Select Resumes, this is what we do; all day, every day, 365 days a year. Our team of writers, editors and designers are all focused on one thing – getting you to interview with a perfectly written cover letter and resume (and key selection criteria if required). We are adept at fashioning documents that perfectly reflect the requirements of your industry and showcase your talents articulately, creatively and succinctly. Once you engage our services, we assign you one of our writers who will have experience writing for your business sector – be it teaching, nursing, IT, mining, public sector, sales, accounting, and engineering – in fact, we have had experience writing in virtually all industries. They will coordinate with you to have a consultation in which they will talk to you at length about your career, your studies and your career outlook. We will also ask you to relate some key achievements that we will summarise into a compelling and persuasive paragraph. These are often overlooked in resumes but are a powerful way to give the recruiter a vivid picture of you as an individual – vital for helping them decide on who to select for an interview shortlist. The entire package will be rounded off with one our exclusive creative templates that have been carefully designed to frame your talents and abilities in their best light – and will be noticed when dozens, possibly hundreds of applications are being filtered through. 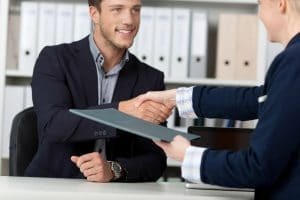 So do not trust to chance or think that your resume will ‘speak for itself’, it is a crucial document to help you secure your future, and we are here to help you attain it. Contact us today for a no-obligation quote.